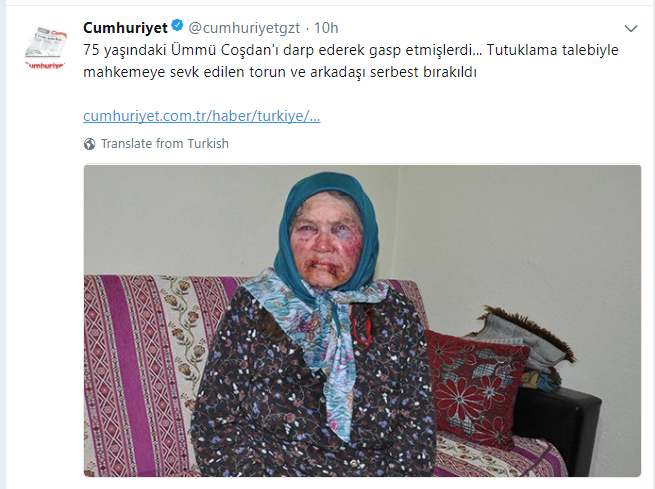 2 suspects who reportedly beat a 75-year old woman last week in Denizli province, were reportedly released by a Denizli judge after a brief interrogation on Monday, the Cumhuriyet daily reported. About 10:00 p.m. Jan. 10, police were called to a home in Denizli’s Çal district, where Ümmü Coşdan was beaten and bruised by two man named Mustafa T. and Durmuş M.
The two suspects, one of them is reported to be Coşdan’s grandson, were soon detained by police and were later referred to court for arrest. However, the judge released the suspects pending trial, according to the Cumhuriyet daily.